The EMC Connectrix ED-DCX-B Backbone Director enables large-scale consolidation,multi-protocol integration, and simplified management to dramatically reduce operational and capital costs. 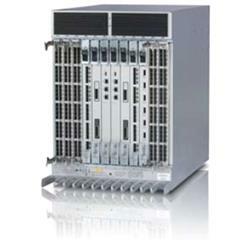 The DCX is designed to support 8 Gb/s Fibre Channel and provide the highest levels of performance. It combines unprecedented scalability and bandwidth with leading innovations in power,cooling and port density. With the ED-DX-B you can build storage area networks(SANs) with hundreds of host and storage connections in open systems or mainframe environments. Additional options are also available, including Fibre Channel cover IP (FCIP) for SAN extension, iSCSI and FICON support and FIPS compliance. With redudant power supplies,fans,control processor blades and core switching blades, the DCX provides enterprise-class levels of availability,reliability and performance.